Always Aubrey: Out & About: More Nashville Eats! Sometimes I go out to a new place and I only snap one or two photos; it's enough for a Yelp review, but not its own blog post. Here are few that I've saved up! Burger Shack isn't in one of the central hubs of Nashville or Franklin; it's in Nolensville in a strip mall off Nolensville Road, and it's a haul to find a way out there since it isn't on a main Interstate vein either. That said, it's the closest thing to an In-N-Out burger that you'll find in the area. It's almost comical just how close it is to an In-N-Out knockoff in terms of menu selection, while having a completely different decor and California theme. We had a Californian with us when we ventured out, and it made him feel a little nostalgic. Overall, this is a solidly good fast food burger. It is definitely reminiscent of In-N-Out, in a really great way. You can even get your burger or fries "California Style" which is their version of "Animal Style". Good fries too! I can't get more descriptive other than agreeing that it's the closest thing to In-N-Out that you'll find in the Nashville area. I think I still like Five Guys or Gabby's for "fast food" burgers, but this is up there. As always, or as it appears, I'm on a quest to eat at pretty much every Korean restaurant in Nashville, in order to form my own opinions. So my bro MM and I went to So Gong Dong Tofu House during lunch one day, venturing once again into the Antioch area where it seems most of the Korean restaurants and groceries are located. As usual, it was located in a nondescript strip mall with a humble storefront. What we found inside, however, was purely delicious! I think it's one of the few places you can get soondobu, Korean spicy tofu soup, which is what MM had. And yes, they put the egg in! I, of course, rocked some K-BBQ kalbi ribs. The banchan were plentiful, the service was good, food served sizzling hot and fresh, and I have zero complaints. This was probably one of my favorites in Nashville, right up there with Korea House but closer for me to access via Franklin. I ended up eating brunch at Urban Grub in 12South on accident one Sunday with my friend Lindsey. Not realizing it was so close according to my GPS to Embers Ski Lodge, where we wanted to eat, we attempted to open the doors only to be told they weren't open yet. We assumed it was Embers that wasn't open yet, and that the internet was wrong with the times, so we went to grab coffee at Frothy Monkey. By the time we got back there was an insane wait for brunch, ugh. (We probably could have gotten in when we first got there.) So we asked if we could go sit at the bar without waiting (yes). We realized we were in Urban Grub when we got our menus, much to our surprise! After all of this confusion, we needed a mimosa. STAT. Our bartender/server was awesome and fast. Lindsey loaded up at their extensive seafood/charcuterie/fruit/TONS-OF-STUFF station, perfect for those eating specific diets. I had the Huevos Ranchero Enchilada, because for some reason I'm on a Mexican kick lately and can't get enough. Delish, and I don't even regret not eating at Embers because this was really great. Way to go, Urban Grub! 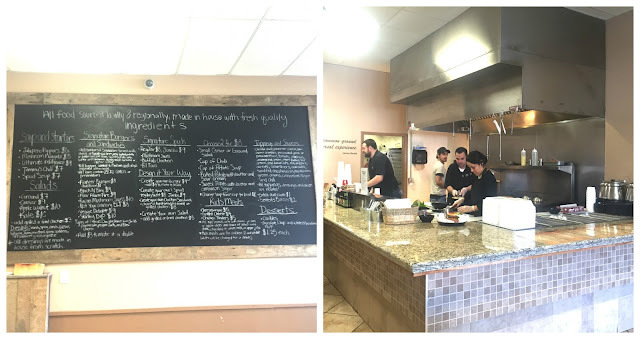 Ground, located in Cool Springs off Carothers near Puffy Muffin, is in the old Jamaicaway spot. I'm always up for some variety for weekday lunch, so MM and I headed over to try it out. You can order starters, burgers, baked potatoes, and salads, or build them custom. It's a sparse and casual setting, but it's clean and friendly at the same time. No frills, just locally and regionally sourced ingredients and good food. I chose to build my own baked potato, while MM had a burger. His assessment on the burger is that it was solidly good, not incredible, kind of meeting that middle ground (and price point) between a fast food burger and a high-end specialty burger (like Burger Republic). Next time I'll have to try one. My spud was hot, fresh, tasty, and it had a kick in the pico de gallo with some pepper seeds. Whew! Overall, I'm not craving a meal at Ground, but it may occasionally work its way into my Cool Springs lunch rotation. I had a cronut (or 100 Layer Donut, since that name is trademarked or something) from Five Daughters Bakery at a party that Lindsey threw, before they had a storefront. You could get them at a local coffee shop or two, I think. But they were so successful that their business exploded with TWO dedicated locations, one in 12South and one in the Factory in Franklin. Y'all know I'm dedicated to Ellie's Old-Fashioned Doughnuts, when I can get them at the farmers market or festivals. They rock cake doughnuts like no other. 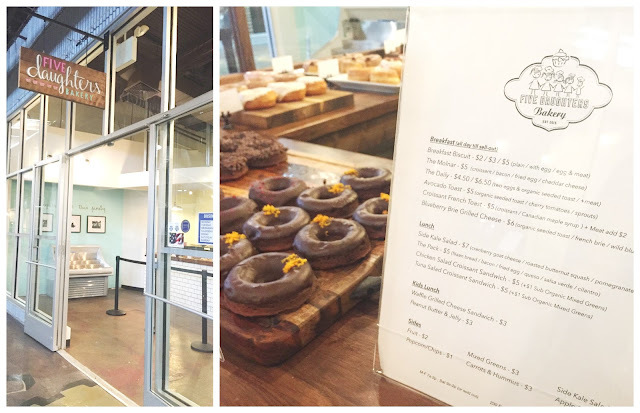 But Five Daughters has a lot to offer, including many different cronuts, vegan and paleo donuts, and the reason I sought them out at the Factory, a Kouign-amann. Theirs is called the "Quinn", and it's delightful. Better than any cronut I've had anywhere, in my opinion. I recommend it, and I love seeing great local businesses coming into the Factory because I felt like it was fizzling for a while. 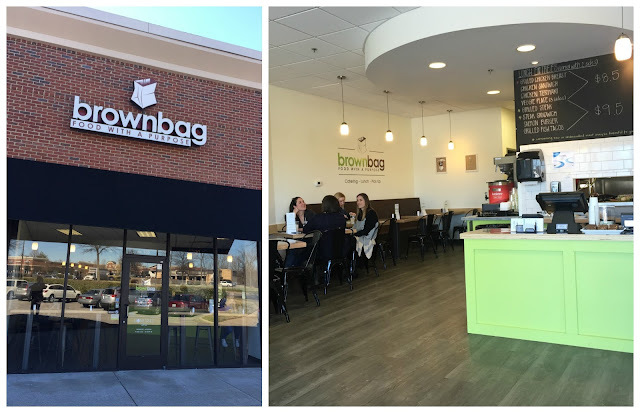 Brown Bag is my new favorite lunch spot in Cool Springs. It's located in the strip mall adjacent to the one that has Chipotle in it, off Cool Springs Blvd. I liken it to a healthier version of a Meat & Three, only it's a Meat & Two! Their mission is delicious, healthy food at reasonable prices. You can get a protein and two sides (or sub one of those sides for a drink or dessert) for $8.50 or $9.50. They're open weekdays for lunch, 11am-2pm. Super smart given that's the Cool Springs busy time! I chose their chicken teriyaki and red skin mashed potatoes. I cleaned my plate! Portions were ample for the price, there are tons of combinations you can chose, and all of the food was well-seasoned and flavorful. Much more economical based on portions than the popular Whole Foods hot bar, and less work since you don't have to haunt the buffet. The other thing I like? From 2-5pm, you can pick up food to take home, specifically trays of protein portions, sides, and more. On a Friday, I had them pack me a tray of 1/2 chicken and 1/2 steak, and ordered some sides like baby spinach salad, grilled asparagus (for Dan), and the mashed potatoes. It felt like a great shortcut to doing some meal prep over the weekend! It will definitely be a great default lunch for me, given its proximity to the office. Whew, those were a lot, right? These pics have been in my phone for months and it feels good to clear them out, AND share with you some great food spots in the Nashville area that maybe didn't have enough to carry an entire post alone. Enjoy!